There’s décor I like, and then there’s décor I can’t. stop. thinking. about. Every week I showcase an item that I am currently obsessing over, aka a “Funk favorite.” I am forever on the hunt for functional accessories that accentuate a home’s natural beauty. 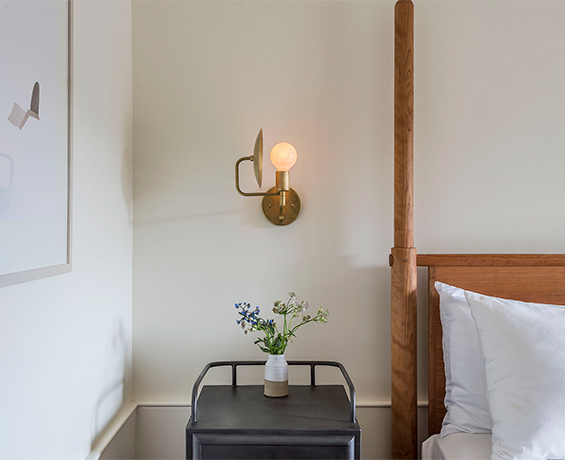 Case in point: the Workstead orbit sconce, a modern twist on the early American candle form. Thanks to a reflective spun brass disc that rotates 320 degrees, the sconce can both reflect and deflect light…now that’s what I call ingenuity! The orbit sconce is one of the key players in the Orbit Series, a collection of unique light fixtures by Workstead. Founded in 2009 by Stefanie Brechbuehler and Robert Andrew Highsmith, Workstead is a studio that highlights the beautiful relationship between architecture, lighting, furniture, and the spaces within which these are contained. In 2012, they gained major recognition for the public spaces they designed for the Wythe Hotel in Brooklyn. Their installations can also be found in the collections of Facebook, Google, Barneys, Levi’s, the Harpoon Brewery, and many more. This sconce feels right at home in an entryway or bedside in a master bedroom. The minimalist design of this piece complements both modern and vintage aesthetics without distracting from a home’s natural blueprint. The true mark of well-designed décor.